Whether you’re just the occasional cigar smoker or you want something compact for your office, desk or small space, this guide will be covering the best small humidors that you can buy online. You can use the links above to jump ahead. Alternatively, jump down to the menu below to see what else we explore in this guide. What Are The Best Small Humidors? Like the large humidor, which we feature in a number of pages, the smaller acrylic humidor offers an excellent airtight seal. Able to store up to 20 cigars, you’ll just need one or two Boveda packs maintain the humidity, which slip into a convenient compartment underneath. As small humidors go, this is the one we’d invest in for either a separate micro-climate for a specific collection or keeping hidden in our desks. The flat top makes it very convenient for easy storage too. Given that it’s transparent, we’d keep this somewhere dark and cool away from the sun’s rays. When all is said and done, we often just turn to Boveda’s humidor bags when looking for small and reliable storage. They come in three different sizes with the smallest able to fit a few sticks and the largest able to store as much as two whole cigar boxes. They’re made with a barrier laminated plastic, which prevents moisture exchange. Meanwhile, the zip lock enclosure create an airtight seal. Unlike regular zip lock bags, there’s no moisture loss. This can be seen thanks to the supplied humidity packs that can take up to a year before going hard. We were pleasantly surprised by the small and affordable Megacra leather humidor. Initially purchased as a display piece for content on Bespoke Unit, we discovered that it actually performed really well! The lid features a magnetic slab designed for placing your devices and the base is thick enough to not cause any moisture exchange. Overall, a very satisfying purchase! Nevertheless, we discarded the humidifier in favour of a 60g Boveda pack. We were very impressed by this heavy duty yet lightweight travel humidor. The FireKing ST is able to carry either 16 or 33 depending on the one you buy. They’re completely waterproof and airtight. Meanwhile, it’s made for being equipped with Boveda packs so we quite liked the thought that went into its design. We picked up the Cuban Crafters on the cheap in thinking that it would offer a handy temporary solution. In fact, we hadn’t planned on using for so long and expected it to be such poor quality that it would be better used for storing cuff links! However, while the seal isn’t the best, it’s excellent for the price paid. We currently use it for holding our cheap sticks near the desk for the occasional break between writing. However, we quickly removed the utterly useless hygrometer and humidifier in favour of two humidity packs and a Boveda Butler. Claiming to be able to store as many as 15 Churchill cigars, Cigar Caddy is one of the better classic travel humidor brands. Their seals tend to be quite airtight and don’t have the gaps that we’ve noticed with some other brands. 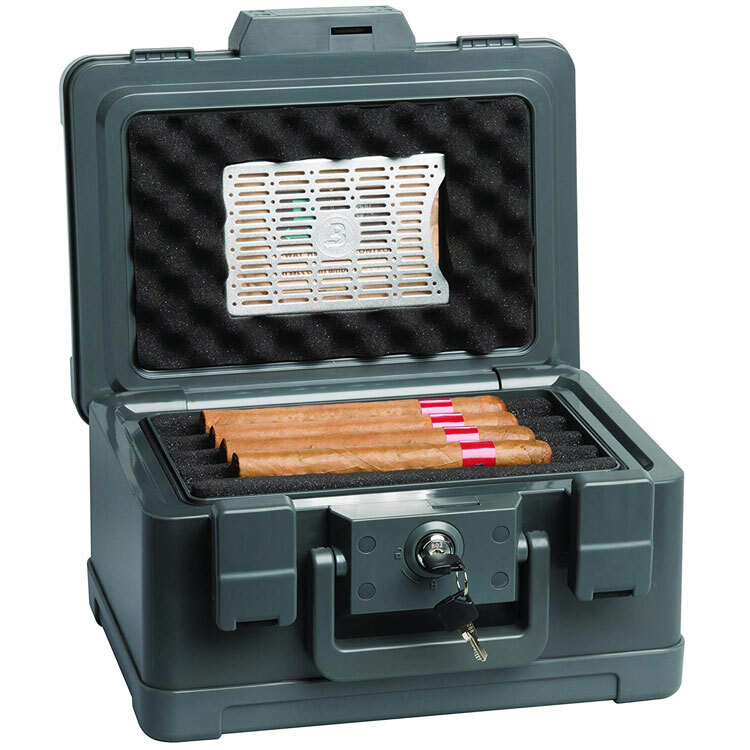 However, even if Cigar Caddy provides good performance, we wouldn’t advise using a travel humidor for long-term storage. If you need something for just a small collection, then a regular humidor might not be necessary. In fact, a humidor needs to be filled to at least 30% of its capacity in order to be effective. If your humidor contains too few cigars, there’s nothing to absorb the circulating moisture, which may cause the humidity to spike. If this is the case for you, then a small humidor may be the most practical option. However, it might not be a question of a small collection. For instance, we like to spread ours out in various storage solutions depending on their humidity requirements. Furthermore, we’re also fond of having the odd humidor here and there for easy access to cigars. For instance, each member of the team has a small humidor on his desk for a relaxing stogie when unwinding after some particularly arduous content. In fact, it’s used to be quite common to have a small desktop humidor on one’s desk to share with clients and colleagues during or after meetings. This logic also applies for the home and it can be quite convenient to have a few small humidors that are portable enough to move around your workplace or at home. Finally, small humidors are often very easy to manage and are great for beginners to learning to understand the basics. Wooden ones are quite easy to prepare and you need only follow our guide on seasoning a humidor to learn how. As for managing the humidity, the smaller environment is less likely to experience fluctuations provided that the seal is of good quality. As mentioned just above, small humidors are less likely to experience fluctuations as long as they have quality seals. However, “small” is often associated with “cheap”. Consequently, there are an affordable budget humidor may be made from inferior materials and feature a poor seal. This makes it imperative to make sure that your purchase is well-researched beforehand. Similarly, small wooden humidors are prone to having very weak seals and may easily leak moisture due to their lightweight lids. However, there are other solutions that aren’t made of wood that avoid this issue altogether. While tupperdors are a great DIY option, you may want something more presentable for the reasons mentioned above. There are a lot of possibilities for this such as the Boveda acrylic humidor that we featured. While it may not be the cheapest, it offers a very reliable seal and is an attractive conversation piece for a desk. For newcomers to owning cigars, it may be tempting to get a small humidor. However, if there’s any chance of your collection growing, we would recommend investing wisely. Small humidors can get crowded very quickly. Therefore, think ahead and always buy just slightly bigger than you think you’ll need. You will want to avoid overfilling a humidor as it will prevent moisture from properly circulating throughout the contents. Similarly, a cramped humidor is a good recipe for damaging your cigars by being crushed! If you temporarily need a small humidor, we would always go for the Boveda humidor bag. This is a great stepping stone to a larger humidor as it requires zero maintenance. What Humidifiers Do You Need For Small Humidors? As long as it features an airtight seal, humidifying a humidor can be extremely simple. Yet, as small humidors can sometimes be quite inexpensive, they may be supplied with inferior hygrometers and humidity devices. Nevertheless, we often discard what’s supplied with even premium humidors in favour of our preferred devices. Most cheap humidifiers only offer one-way humidity, which means that they continuously release moisture. Even when the desired level has been reached, they will continue to diffuse it. They also need to be recharged regularly and they don’t diffuse the moisture evenly throughout the humidor. While uneven distribution of moisture is unlikely to be an issue in small humidors, over-humidification can happen very quickly and easily. 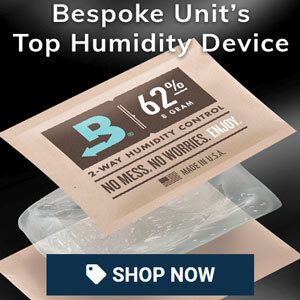 For small humidors, we only use 60g Boveda Humidity Packs. Not only are they small enough for cramped humidors but they also offer two-way humidity control. This means that they absorb excess humidity as well as release it when levels drop again. Given that small humidors will never have a capacity of over 50 cigars, you’ll never need more than two 60g packs. Simply use one for every 25 cigar capacity of a humidor and you’ll be good to go. Reviewed by William F., on 2nd November . "Found the best humidor for me. Was looking for something for my desk and found just the right humidor here!"